Our new messenger marks the culmination of a year’s worth of work. We’re announcing our new messenger to help businesses more personally connect with their customers. We believe communication between businesses and customers is changing forever. Just as communication technology is changing how we connect with our family and friends, the future for communicating with businesses is being built on social platforms, using modern messaging, and less and less on things like email and live chat. Our new messenger has been the biggest project we’ve ever undertaken. It has taken more than a year, which for a team that prides ourselves on many small releases, is up to 10 times longer than the norm. We’ve learned a lot along the way, exploring, designing, and prototyping with new communication channels, bots, machine learning, and much more. We sweated so many details to create the single best messenger for businesses, one that deeply understands and solves business problems, with an execution bar that needed to be better than the best consumer messengers out there. When it comes to communicating with one another, we’ve all seen amazing new things happen over the past decade. We can know what our friends and family are doing at any point anywhere in the world. We can see what they see, hear what they hear, and even feel what they feel. Critically though, the world of business remains in the past. While messaging apps have become the default way we communicate with family and friends, businesses are still predominantly using old technologies like email and live chat to talk with customers. When it comes to interacting with businesses, customers today want to communicate with the people behind the business, not with a faceless brand, or through soulless technologies like ticketing systems. These preferences are even more profound with younger generations of consumers. Businesses still predominantly send poorly targeted mass messages, a one-size-fits-all approach in a world where people can directly message anyone they know. Messages still come from unnamed teams, in a world of increasing transparency and openness. Businesses use decades-old technology like live chat and email, and focus on desktop platforms that are shrinking in prominence. 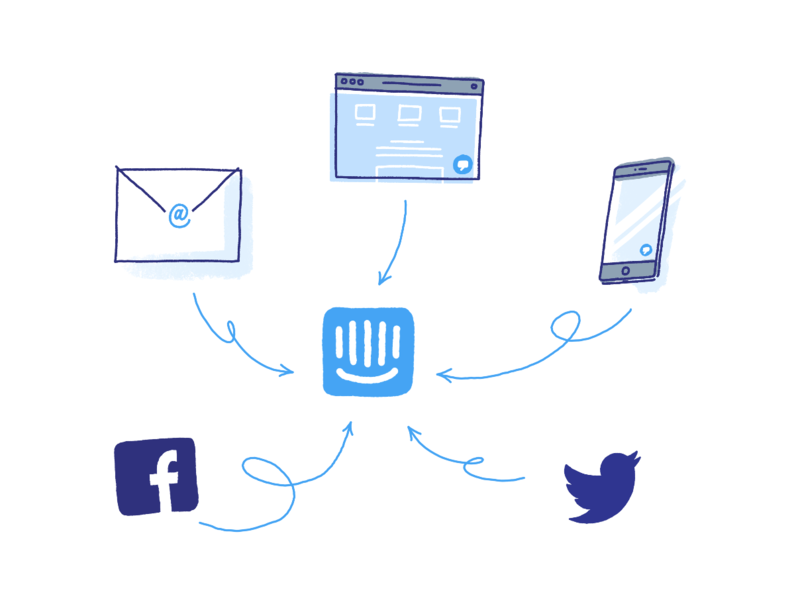 Intercom released the world’s first in-app messenger in 2011, and since then we’ve seen targeted, personal in-app messages become a primary channel for the 13,000 businesses on our platform. A lot has changed in the past 12 months, never mind the past 5 years. Messengers are fast becoming one of the most exciting communication channels for businesses, and our goal is to be out in front, inventing the future. Real businesses have different needs when it comes to messaging customers. Sometimes they need to be interruptive, sometimes more discreet. Sometimes they want to use rich media to communicate, sometimes they only want text. Customers also have distinct needs. They want to choose what platform to communicate from, and want to communicate emotion as much as information. Hence the rise in non-text based communication like emoji, stickers, photos, videos, and more. Different types of message formats. Messages have different objectives, and we have three message types to cover a range of use cases. Chat is great for starting conversations. Notes are great for sharing quick updates. And Posts are perfect for telling a longer story – we’re using one to announce our messenger today. Different types of delivery. Sometimes businesses need to be interruptive, taking over the full screen, but sometimes they simply need to let people know there is a new message waiting for when they are ready to check it out. Research with our customers taught us they needed our messenger to distinguish between ‘content’ and ‘interruptiveness’ and break them into two options. We built our messenger to support different types of media and delivery options. Different ways to respond. Sometimes businesses need to initiate a conversation, but sometimes they just want a quick reaction. Our messenger was the first to offer lightweight replies as a way to respond, and now we support a massive range of options through emoji reactions. Customization. Businesses need customization options to make messengers feel more personal and more bespoke to them. We built a much richer profile so people can get to know one another a little, customization options like color and background wallpaper. Different platforms. More and more businesses are running on web, iOS and Android. We knew from talking to our mobile customers that they wanted something that felt native, that looked and felt like their own app. Different channels. Businesses use web, push, in-app, Facebook, Twitter and more for different (good) reasons, and will never coalesce into using a single channel. Our new messenger supports all of the above – a real messaging solution for real businesses. And it’s built on the Intercom platform, which lets businesses use their customer data to deeply personalize their messages. Communication between people and businesses is changing forever, and messaging will play a central role today and for years to come. We think this release is a big step forward. One of the big goals with the new Intercom Messenger is to set our customers up to succeed in the long term. What we’re announcing today is just the start. We’ve been thinking a lot about themes like conversational UIs, bots, and AI and machine learning…Watch this space. You can try out our new messenger today! Editor’s note: This is the first of five posts explaining the thinking behind our new Messenger.